Digital Ultraviolet and Digital Copy will makes it possible for you to stream the movie The 15:17 To Paris Ultraviolet or iTunes Code instantly to your computer and compatible Smartphones, Andriod, iphone, iPod Touch, iPad and tablets devices anytime, anywhere. You can also download a Digital Ultraviolet Copy or a Digital Copy of the movie The 15:17 To Paris UV or iTunes Code to your computer and compatible devices. 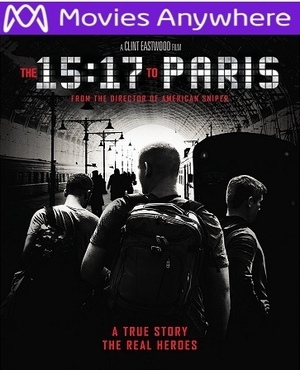 “The 15:17 to Paris” follows the course of the friends’ lives, from the struggles of childhood through finding their footing in life, to the series of unlikely events leading up to the attack. Throughout the harrowing ordeal, their friendship never wavers, making it their greatest weapon and allowing them to save the lives of the more than 500 passengers on board.